The therapeutic effects of ginkgo biloba are attributed to a mixture of the active ingredient especially the flavo-glycosides, which have free radical and antioxidant properties, and the terpens, which have anti-inflammatory properties. A principal effect is by inhibition of the platelet activating factor (PAF). PAF, produced by many tissues, is associated with aggregation of platelets as well as causing broncho constriction, vasoconstriction, chemotaxis of phagocytes hypotension, and the release of inflammatory compounds of phagocytes inhibiting PAF, ginkgo blocks all these effects, and therefore reduces clotting brochospasm and other allergic responses. Bilobalide acts in concert with the ginkgolides to enhance cerebral circulation and increase oxygen flow to the brain tissue and hence the cognitive benefits. Other circulatory benefits noted in patients with hearing problems due to poor circulation in the ear. It reported that about 40% of these patients have improves hearing after 6 months of treatment with ginkgo extract. The aim of the present study was to assess the bioavailability of the main active ingredient in Gincer, ginkgolid B. The study also focused on the pharmacokinetics of two different dosage regimens for orally administered gincer 80 mg once daily and 40 mg twice daily for 7 days. Statistical analysis was used to assess the main pharmacokinetic parameters. The results show that a dosage of 40 mg twice daily (every 12 hrs.) is accompanied by a significantly longer half life (t½) and mean residence time (MRT) than a single 80 mg dose. Even though the latter causes a higher concentration peak (Cmax). The maximum concentration time (Tmax) is 2.3 hrs. after administration in both treatments. Gincer has also been found to improve sexual dysfunction caused by SSRI medications such as Prozac, luvox, paxil and Zoloft. Asthma control benefits are due to gingkos anti- allergic properties. High doses of Ginkgo biloba could decrease the effectiveness of anticonvulsant therapy in patients taking carbamazepine or valproic acid to control seizures. Ginkgo has blood-thinning properties and therefore should not be used if you are taking anticoagulant (blood-thinning) medications, such as aspirin, clopidogrel, dipyridamole, heparin. Ginkgo biloba may be beneficial during treatment with cyclosporine because of its ability to protect cell membranes from damage. Ginkgo may enhance the effects (both good and bad) of antidepressant medications known as MAOIs, such as phenelzine and tranylcypromine. The combination of papaverine and ginkgo may be effective for the treatment of erectile dysfunction in patients who do not respond to papaverine alone. Although there has been one literature report of increased blood pressure associated with the use of ginkgo during treatment with thiazide diuretics, this interaction has not been verified by clinical trials. Do not use if you have hemophilia or have any other clotting disorder without approval and monitoring by a physician as Gincer has been reported as having anticoagulant activity. According to recent studies on drug and herb interactions. Do not handle the fruit if you are allergic to poison ivy, mango rind, and cashew nut shell oil, as they are structurally similar to the allergens of Gincer. Do not use if pregnant – Safety for use in pregnancy has not been established. Some contraindications are thought to exist. This herb is not recommended for nursing mothers – Safety for use in pregnancy has not been established as many ingested substances are excreted in human milk. 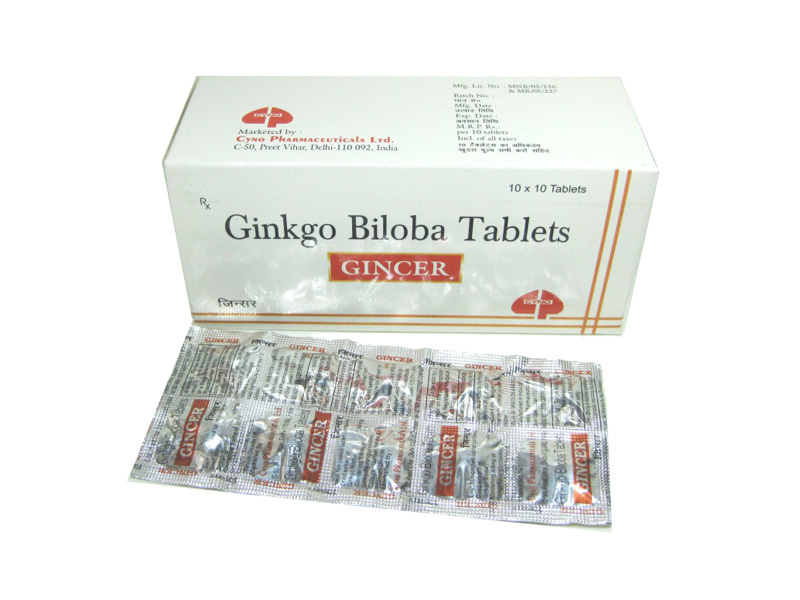 Gincer 80 mg once daily and 40 mg twice daily for 7 days.